Discussion in 'Leica and Rangefinders' started by bryan_jones|4, Jan 11, 2005.
quite some time and this is my first post. Pentax Spotmatic and Bronica S2a right now). only go for the best, but I await your advice. "I suspect many might say go for the Contax first and wait to earn the M3.." <p> Ummm not here! The Contax, while fun (I have a 1937 III), is purely collectible in my book. For everyday usability, maintainability, lens choice, the M series is a whole different ball game. I have a IIIa and an M3 (and 2 M6s and 2 IIIfs). The M3 is much more user-friendly and it is is much quieter. As an example, when you turn the IIIa's aperture ring you are likely to change the focus. In fact it is nearly impossible to change the aperture without changing the focus. The M3 has a lever wind and the Contax has a knob. The viewfinder on the M3 is also much better in my opinion. Having said all of that. The Contax is a beautiful camera... a great shutter mechanism... good rangefinder... solid... and great looking. If you want it for taking pictures, I'd go with the M3. The Contax is an example of great engineering but as a useable relic? Forget it. The M3 has bright frame lines in the finder, is readily repairable should you need it, and lenses are easy to find, from classics made half a century or more ago to the latest multi-coated aspheric designs. The Contax is an exquisite piece for it's time but the shutter is a bit tempermental, according to those I have spoken to. The M3 is still solid as a rock. Bryan, I've got an M3 for about a week now and like it (a late >1,1million single stroke, it was CLA'd by DAG 2 yrs ago, just a lucky happenstance as was the quickload kit inside it, got from KEH in bargain for $750 and has an M4 flash port too)but I've got other M bodies and no way I'd want just an M3 because no 35mm frames. I'd suggest an M2. KEH has one in bargain for $599 now (actually they seem to have another M3 SS w. M4 flash port if you really want one). I know a camera store near here that has a super-clean 50 Cron rigid for $525, sounds expensive but they're very hard to find with intact front coating and what bargain is saving $200 and having a low-contrast flare-city lens? I've got a screw mount, cool camera as Al says but as a daily shooter I'll take an M any time. You can quite easily get a Contax IIa + 1.5 sonnar for about $500. The M3 + 50 will take you to at least 1000 if you throw in a DAG CLA. On the merits, the Contax 1.5 sonnar is an exquisitely beautiful lens, both in build and results. However, as noted above, when you turn the aperture, there is the chance that you will accidentally turn your focus. With practice that is a non-issue. The biggest pros for Contax are: small size, lighter weight, great optics, very simple reliable camera. 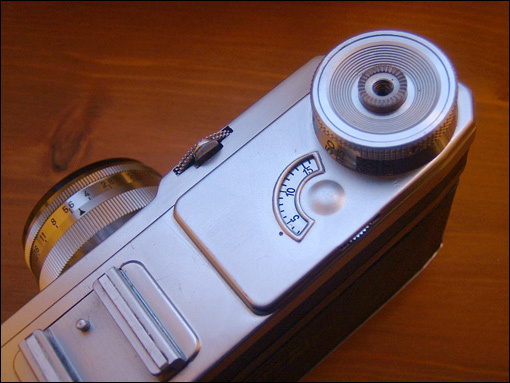 The cons are: aperture ergonomics, VERY VERY small viewfinder compared to the M3. In fact, I consider the M3's viewfinder to be the best of all Leicas. I've been busy doing ac oomplete restoration on a couple of prewar Contax II's. The first of two I finished on Sunday (pictured with a postwar Sonnar). One or the other might come up for sale sometime in the next while if you want a clean one. I shoot these cameras because (a) they are beautiful mechanical gems (b) I am a masochist (c) because I can afford them (d) the lenses, especially the postwar Oberkochen glass. They are wonderful cameras but I think don't compete well against an M3 in the usability department. Knob wind, 50mm viewfinder only, no parallax correction. They have the Leica beat in effective rangefinder base length (especially the II) and just slightly in top speed. The prewar rangefinder is practically immune to misalignment due to use. You won't burn a hole in a Contax curtain! Its not clear from the differing title and text: is it a Contax II (prewar) or Contax IIA (postwar) that you seek? How do you figure a Contax CLA is going to be less than DAG? A Henry Scherer CLA for a prewar Contax runs over $300. M4-2 user, Hexanon 50/2.0 and yer laughin'. The M3 is one generation more advanced than the Contax. Compared to a LTM Leica the Contax is my choice but the M is much more versatile. Another concern are spareparts and people capable of servicing them. I had a PERFECT IIIa and used it for a few years. Now I have an M3....WAY better camera. You can get an M3 for around $600 from KEH that should work fine at least for a while. You can get a user Summicron Rigid or Collapsible for $250 or so. If you want to have some fun with a Contax, buy a Kiev 2. I own a Kiev with a couple of lenses, and it's lots of fun to use. My M2 beats it hands down, however. The difference between the viewfinders is like night and day. The Leica is much nicer to use in every way. As a four decade long user of Leica rangefinder cameras and poor as a church mouse when I bought my M-4 years ago on a time payment plan with a local camera shop - aren't those days long gone - my high recommendation is that you save your hard earned money and purchase a Leica M-3. Good God what a beautiful camera Mike! And nice job on the restoration. 'Tis a labour of love. I have over 20 hours of my precious free time in that camera. Ditto on the Kiev suggestion. My $40 1960 Kiev 4A + matching Jupiter 8M got me started with this Contax love affair. It might also give Bryan a chance to try a rangefinder before commiting a lot of money. I'd like an M3 but its not going to happen anytime soon. That Contax II was only $130 off ebay but was nearly unusable as it came. I think a Leica IIIc is in my future but I want to service it myself. The prices even on junked M gear is ludicrous. I'll echo the group, as I've had the Contax II and IIa, Kievs, and various M's. The M3 beats the IIa hands down in my book. Usability is better with lever winding. The parallex corrected, brightline finder is better in typical examples. The lens selection is 10x as good. It's no contest. If you want to play with a Contax, find a nice, 1950's Kiev 3 and a Jupiter-8. This camera was very close to the pre-war Contax II in build quality, as the original equipment was still being used before being overworked in the Soviet Union. The more common 70's cameras like the Kiev 4 and 4M are OK, but definitely show the falling workmanship and worn machinery. The shutters are also usually off in the Contaxes and can be pricy to fix. Many repairmen use Kiev shutters to repair pre-war Contaxes as the parts are interchangable. The Contax's are definitely jewel-like in construction, but really are sub-standard compared to the M's for use. Find a nice M3 that's been CLA'd by someone good and buy a 50/2 M-Hexanon for $250, a superbly-built copy of a late Summicron. I've got one and it's a beauty. The 50/1.5 Nokton is also a winner for about the same price, but not a well-built. If you look hard, you should be able to find a nice M3 for $750. The vulcanite might be broken in a couple of places and the top might be scratched, but if the RF is nie and the insides have had work, it's the way to go. If you can find one with a SS# engraved into the camera, that cuts another $50-150. As much as it pains me to agree w/the Leicaphiles ;-), & I can quibble w/some of the opinions stated here (e.g., I don't think the Contax is really louder than an M3, just different in pitch & a CLA does *not* have to cost $300 as there are some other good repairpersons other than Mr. Scherer who charge less), but I must concur that the M3 is a better user & has the advantage of taking modern glass if you so desire. My bottom line: if @ all possible, get both! I started w/the Contax & later added Leicas, but still use both. "I certainly enjoy using the Contax RFs, but the Leica M3 (or M2 if you prefer using a 35mm lens) is probably a better & more practical choice for *most* people. IMHO, the M3 has the best RF viewfinder ever, even compared to the current M6 or M7. The M3 was a revolutionary camera in its time because of its VF, which is indeed brighter than the Contax & has parallax-adjusting illuminated framelines (unlike the Contax, which only provides the 50mm view, has no parallax correction, & requires accessory finders for every other focal length). Also, since Leica is still in business, the M3 takes a wider variety of lenses, including some of the best modern glass (plus the old thread mount stuff). from the 1930s until the introduction of the M3 in 1954 (there's nothing wrong w/a little nostalgia!). True, a IIa or II is not as "user-friendly" as an M3. However, a IIa/II body in good working condition should run you considerably less than an M3 & will be just as reliable, assuming it's been properly repaired &/or maintained. More importantly, the Zeiss lenses for the Contax are usually better, & cheaper, than their Leica competition from the same time period (which is why Henri Cartier-Bresson used a thread mount Zeiss 50/1.5 Sonnar on his Leicas! ), although not as "good" (i.e., sharp & flare resistant) as modern Leica glass. I love my modern Leica lenses, but I also love the unique look provided by the old Zeiss stuff. The bottom line is that if you don't care about using modern lenses, do most of your photography during the day & w/a 50mm lens (or don't mind using accessory finders), or just prefer a more leisurely shooting style, the IIa is an economical alternative to the M3. If you do a lot of low-light shooting, tend to use a wide variety of focal lengths, & want to use modern glass, then the M3 is the way to go." I started with Leica's and always wanted a Contax, so now I have a couple of Kiev's. Like has been said before buy the Leica but pick up a Contax or Kiev to play with they are great fun. The M3, maybe take a long term approach if you can stand to. Buy a user body that you can afford, "the" auction site occaisonally has more sellers than buyers. 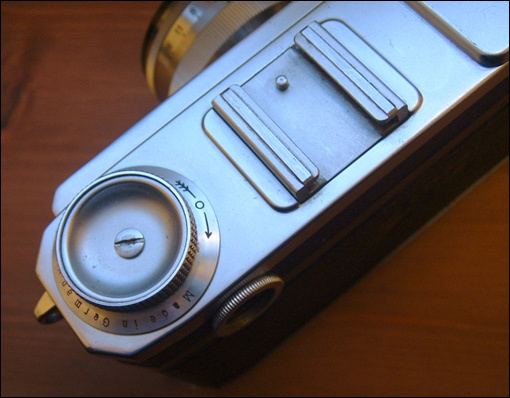 Make sure to find out that the rangefinder isn't separating, i.e., dark. Count on needing a CLA when you can afford it. Leica bayonet mount lenses like the 135mm Hektor ($75) and 35mm summeron ($100+) can go really cheaply at auction if you are patient and disciplined. You can also acquire screw to bayonet mount adaptors for 50mm, 90mm and 135mm and use old Leica screwmount lenses or for that matter Nikon screwmount, etc. M3's don't wear out but do require adjusting and cleaning every 15 yrs or so. The main thing to watch for is rangefinder separation although I've read that the later models are not as prone as the earlier ones. If you do decide on a Contax don't bother with the pre-war Contax II, the curtain ribbons have a tendancy to break with age and many camera techies won't touch them, I don't believe there are shutter ribbons on the post war IIA version. There are just as many techies out there who can & will work on a Contax II as there are those who will work on a IIa, not even including the guys who work on Kievs (which are mechanically similar, if not identical to the pre-war Contax). "If you do decide on a Contax don't bother with the pre-war Contax II, the curtain ribbons have a tendancy to break with age and many camera techies won't touch them . . ."
The 50/1.5 Sonnar is an exceptional piece of glass. It is sharp above f/2, high color fidelity, smooth bokeh, and it is cheap. $250 at the most for a really clean sample. I have the IIa but recommend instead the Cosina Voigtlander R2C. The R2C's finder is way brighter and better and then there is TTL metering. The M3 is for sure the more practical camera. It's the one I'd choose in your position. OTOH the Zeiss lenses for the Contaxes are excellent even by modern standards. The 50mm f/1.5 Sonnar wipes the floor with any high-speed 50 Leitz made prior to the last pre-ASPH Summilux (I personally prefer the Sonnar to the 'Lux) and can be had inexpensively. Though I still own a Contax IIa I ended up getting a Sonnar in LTM. Problem solved. Raymond mentions an option I should've mentioned as well, seeing as I own one: the CV Bessa R2C. The viewfinder is far superior to that of the Contaxes. RF accuracy is reduced, however, which can be a problem with an 85mm f/2 wide open at close range. The Bessa certainly isn't an M3 but it's a good, solid camera nonetheless. Buy one from Stephen Gandy (CameraQuest in the LA area) or Rich Pinto (PhotoVillage in NYC) and you get a proper warranty too. IMO the only missing piece in the Zeiss RF lens system is a fast 35mm. The available lenses are all first-class, though, with the exception of the 85mm f/4 Triotar. The post-WWII coated Triotar isn't bad really, just average. Zeiss did have 1 other "dog:" the pre-WWII 28/8 Tessar. Of course, the competition in that focal length was also pretty bad! The M3 is a more modern camera, but the Contax IIa is a thing of beauty and precision. Once properly serviced, there's no reason it won't give you decades of use. It's an older camera in that it has no framelines and no lever wind or rewind crank, and the selection of lenses are limited. There aren't a dozen versions of the 50mm Sonnar. Just two postwar versions: f/1.5 and f/2.0. There are no high-speed lenses. Actually, there are East German, Zeiss-Opton and Carl Zeiss versions of most of the lenses. No ASPH lenses, and no multicoating. Design, construction and build quality are first class. Postwar lenses include the 21mm and 35mm Biogons, 35mm Planar, f/1.5 and f/2.0 50mm Sonnar, f/3.5 50mm Tessar, f/2.0 85mm Sonnar, f/4.0 85mm Triotar and f/4.0 135mm Sonnar. All of the lenses are well made. I can't think of any instance when I've knocked the aperture ring of its setting. Most people are baffled by the infinity lock, but it's no different than getting use to the infinity lock on an LTM. If you're looking for a modern-day rangefinder experience, get the M3. If you want a no-compromise classic camera, the Contax IIa is an excellent choice. You can expect that both will need to be serviced. And because the Contax IIa uses a metal shutter, you can't burn a hole in it when you put the camera down on a table on a sunny day. Loading either will take time. A Contax IIa with the f/1.5 Sonnar typically sells for about $400 (give or take $100) on eBay. Figure on another $200 or so for a CLA. At one time, I owned seven of these. I'm down to two, plus a small number of other Zeiss-Ikon cameras. I brought a very nice Contax III in working order (meter excepted) for $90,00, after winding and releasing the shutter about 15 times the curtain ribbons broke. The quote to fix it from my classic camera repair shop was in the neighbourhood of $250.00 to $300.00, even then they were reluctant (setting up shutter timing, etc problems). You are right, you can get them repaired but the repair costs you more than the body is worth, not even including a CLA. Granted it makes a very nice vintage paper weight. On the other hand the Leica M3 is pretty much a modern classic worth sinking $300.00 into if necessary. I own Contax II and IIa, but not an M3 (though I have worked on them). I'm afraid there is no question that the Leica is a more practical machine than the Contaxes, it's a much more modern design. If you do look for a Contax, I think the II is a better bet than the IIa on average. The prewar ribbons may break, but they are relatively easy to fix, any Kiev techie will do it. The postwar shutter did not break ribbons, but it faded badly and often (something that the II never did), and its rangefinder can and often does go out of alignment vertically (also something the II never did; worse, ZI didn't expect the IIa to either so they didn't design in an adjsutment to correct it). A good Kiev is also a good option: it has the design robustness of the II with the flash synch of the IIa, cheaper than either one. Just be careful to get a good one. I don't know where you're located, Rod, but in the U.S., there are quite a few places that will fix a Contax II/III shutter for significantly less than $250-300, depending on how bad the problem is. Re: the market value of the body. 1st, the value has nothing to do w/its usability; if you have no desire to sell your Contax, or Leica, it makes no difference that the Leica will fetch more. 2nd, the Contax is less expensive to begin with. So, yes, a Contax II is not worth as much as an M3 in comparable condition, but since the Contax, & its lenses, costs 1/2 as much as the Leica equipment (& able to take equally good pix), your "start up" costs are still less. Thus, even if you had spent $300 to fix your Contax III, you'd still have spent only $390 to get an older "classic," which is still considerably less (about 1/2) than you would have had to spend to get an M3 in comparable working condition. Again, I have nothing against the M3 or Leicas in general, but a Contax can be a very economical & practical choice for real world shooting. I know, because I use them all the time to take pix & my entire collection of over a dozen Zeiss lenses in Contax RF mount, which span the range from 21 to 180mm, cost about the same as my 3 modern Leica (actually made by Leica) lenses! On the other hand the Leica M3 is pretty much a modern classic worth sinking $300.00 into if necessary." If you want to have a shooter the Leica M series is way above the Contax. But the Contax is not a bad camera, just not as usable as a Leica M. You might try a Kiev 4am instead of a contax, they can be found for USD 50+ including a lens and can give you the feeling. Nevertheless if you want a classic mechanical RF then stay with Leica. I have two M2s myself, liking them better than the M3 due to the 35mm framelines. The M4-2 prices seem also to be quite reasonable nowadays, finding working user bodies below USD 700 is possible. If the body works fine I do not think you need a CLA right now - so adding the cost to the budget you have right now seems to be unnecessary to me: If you buy a working one from a reliable source it will give you some if not many years of use before you have to give it a CLA. As for the lenses, there are multiple options: A fitting 50 Summicron is nice of course, but there are lots of other lenses which also would fit the bill. Cheapest option (around USD 50) is a russian 50 like the Jupiter-8 with a LTM adaptor. Great lens, at least the examples I saw, but cheap feeling. Nevertheless they can be had for an unbeatable price. Next choice for me would be a 40/2 Rokkor or Summicron-C or a 50 Hexanon if you prefer good modern looking lenses - or either the 40 or 50 Noktons from Voigtlaender. Or if you prefer the classic look then take a 35 Summaron (with eyes, they are not as small, but way cheaper than the ones without) or a Summitar. All these packages should be less than USD 1000 (without a CLA, but with a guarantee from the previous owner that the camera is working). Nevertheless: If I were to spend this amount for a RF camera now, I would rather look for either a Leica CL/Minolta CLE with the superb 40 /2 and 90/4 lenses if I would look for a compact camera or a Hexar RF set including the 50 Hexanon if I were looking for a rangefinder workhorse. The Voigtlaender Bessa series is also an option, letting you buy a body plus lens new for less than your limit, but I do not like the bodies - YMMV. Wow! This thread never ends! I recently got a lovely M3 on Ebay for $450 -- 1957 double stroke. It works great: right now, it's with Morgan Sparks in Burlington, Vt. (Cameraleather.com) getting a new cover --MATTE BLACK OSTRICH! I bought a reasonably clean 50 collapsible Summicron on Ebay for $290. My "test" pictures came out fine -- you can see them by clicking on my Photonet sight & bring up "M3 test pictures." IE. don't screw around with an old Contax! I own a post-war Contax IIa with Sonnar 1.5/50 and I also own a M3 with Summicron 2.0/50. 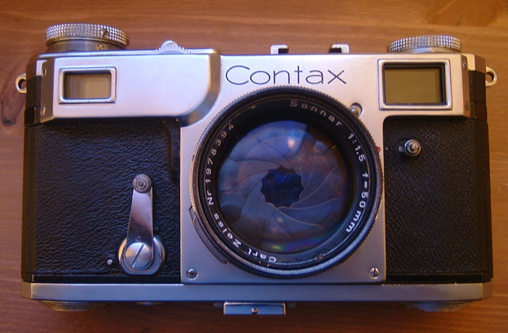 The Sonnar is an exequisite piece of glass but the Contax is hardly used because the shutter has broken down twice. The reputation of the Contax is that the shutter is prone to failure. Too bad since the rest of the camera stands up to Leica M3 quality and the rangefinder of the Contax even surpasses the Leica. My M3 (and M2/ M4) camera's are extremely reliable. Technical quality and durable engineering is unsurpassed by Leica. My grandson will use my Leica's. the Contax will remain a display feature. For reliability get an M3 (or M2 / M4). Christopher: "I don't know where you're located, Rod..."
That would be in the heart of Canada's liveliest and most sophisticated metropolis, To. (or T-zero as the rest of the country likes to say). I still plan to get a Cintax IIA for interests sake and because they are historic jewels, but under any circumstances Leica M is my first choice for all of the above mentioned reasons. Paul, from the pix I saw you are certainly getting your money's worth. Rod you are being quoted way too much for a ribbon repair. I haven't needed to replace any yet in my cameras but I could confidently have the entire shutter module out of the camera in less than an hour, and I'm not even certain that you need to go this far to do a straight ribbon replacment. Steve Ash in the UK will do a complete overhaul including the ribbons for 50 pounds. For $315 US, Henry Scherer will tear down the entire shutter and gearing to scratch and rebuild it, plus give the camera an equally thorough CLA treatment. I think the Henry Scherer CLA is more than what you get from DAG or any camera repairman I have ever heard of. Mike Elek: 7 Contaxes? I'd like to put it on the official record that its your fault that I started with Contax cameras <grin>. Mike's musings on his website really show his love for these cameras and the love is infectious! I've got a beater Leica M3 that needs a new rewind knob and a CLA for vertical misalignment and for a bad transition from fast to slow speeds (i.e. after firing 1/125th and then going to 1/30th, it takes a few firings before the 1/30th will go off. In the meantime, the shutter seems to fire a very fast speed like 1/500th). Fortunately, someone on the forum just sent me a rewind knob along with its little assembly parts. So this could be done along with the CLA. In addition, I'd throw in a scratched rigid Summicron. It's got some haze and scratches on the front element, but still takes fine pictures. I'd offer you everything for $700 +$15 shipping. Factor a $200 CLA in and you're under your $1000 budget. This offer is also put out to everyone at photo.net. I've got pictures if you want as well. Andre how is the rangefinder contrast? Bad rangefinders are the one "gotcha" with the M3 (and M2) that is nearly impossible (or ridiculously expensive) to fix. "Rod you are being quoted way too much for a ribbon repair." Mike, it's more likely it's my mistaken negativity toward pre-war Contaxes. Face time with the camera repair dude completely discouraged me. That said, and even though I suspect Christopher is an incurable romantic (smile) I really appreciate his thoughts and will re-evaluate. BTW, thanks for your helpful imput too, it'll be a while but I'll probably get the old Contax III up and working again. I've taken to thinking of this as the photonet deer-in-the-headlights string. I just think the Contax, particularly the pre-war II/III, gets a bad rap as some kind of quirky, temperamental "delicate genius" of a camera, not just from Leica-nuts, but even some Contax afficionados (like Mr. Scherer). To the contrary, the Contax II/III wasn't just technologically advanced for its time, but it was also a real professional-quality system fully capable of being used in harsh conditions by pros (& rich amateurs, of course), sort of the Canon EOS of its era. True, the shutter mechanisms are more complicated than the Leicas, & since Zeiss Ikon went under in 1970 there are fewer camera techs who are familiar w/them, but there's nothing inherently wrong w/the cameras. Indeed, that's 1 reason why I like the M3--it was the camera that finally bested the mighty Contax & helped drive Zeiss Ikon out of RFs (& eventually out of business). Sadly, the M3 also reminds us that Leica was once a plucky company capable of great technological innovation. "Mike, it's more likely it's my mistaken negativity toward pre-war Contaxes. Face time with the camera repair dude completely discouraged me. That said, and even though I suspect Christopher is an incurable romantic (smile) I really appreciate his thoughts and will re-evaluate. BTW, thanks for your helpful imput too, it'll be a while but I'll probably get the old Contax III up and working again." The Contax IIa is a much smaller camera than the Contax II and as far as I can tell shares no parts. The lens mount is identical though not interchangeable. Once you get those pesky shutter straps replaced, you have a very fine camera with the Contax II. The wide base rangefinder is excellent, though eyeglass wearers will be challenged by the small reticle, but no more so than an LTM Leica, though the Contax has the advantage of having a unified rangefinder/viewfinder -- something it incorporated when the camera was introduced in the mid-1930s. However, keep in mind that it is a 70-year-old camera (while the Contax IIa is merely 50-55 years old! ), so a proper CLA should be in order before you should use it. Robert Capa took the Contax II to Normandy to record the D-Day invasion. I have owned both the Contax IIa (Balck Dial) and the M3. I even have "The Contax Way" book from the 50's. Without a doubt I would say get the M3 and I am a ZEISS man! Three reasons for going with the M3. 1. It has a MUCH better viewfinder. 2. You can get them serviced easily. 3. You have a wide choice of lenses for it, new and used. I just had my 1963 M3 converted to M4 loading and the Leica M motor drive. You can't do that with a IIa or IIIa. Getting lenses is a problem for the Contax. CV did make a few WA lenes in the Contax mount but they have recently been discontinued. I still love the Contax IIa design but have to admit that it's just not pratical for every day use. Wow, I never though that I would spark such a thread! After reading through, I have to say that the M3 looks like the better choice, although I will probably end up getting the Contax some time down the road to try it out. Christopher mentioned that CZ 50/1.5 Sonnars are available in LTM. This my be a viable option before plunking down the money for a 'cron or 'lux. However, I like the idea of the 'cron's focus tab which I assume is missing on the CZ lens. I assume these are available on ebay or at KEH. Also, despite the M3 not having 35mm framelines, I have read that the entire viewfinder can be used as a 35mm approximation. Is this true? I would really like to use an M3 due to the higher magnification and two-eye shooting capability. Christopher can correct me if I'm wrong, but I think that only the wartime Sonnar was available in LTM. The lens may or may not be coated, and if coated, it may or may not be marked with a red T. FYI serial numbers greater than 3000000 from Jena are generally regarded as postwar. The Oberkochen "Opton" lenses use a different numbering scheme. The Jena postwar lenses use a cheaper aluminum barrel rather than the chrome plated brass of the Oberkochens. The prewar lenses are of HEAVY brass construction. Unless the LTM 50/1.5 is different than my prewar 50/1.5 Sonnar, mine only stops down to f/11 (f/16 postwar) and the aperture scale is not linear. The postwar lens has a 12-bladed double aperture, the prewar lens a 14-bladed single aperture. My prewar Sonnar is uncoated - its a very sharp lens but contrast is less and lower light transmission makes the f/1.5 a more realistic t/2 IMO. Its a cool lens, just not the one I choose for general purpose work. Most of the LTM Sonnars I've seen are from East Germany. I think I've seen a small number of non-East German LTM Sonnars. I have an East German Jena "T" f/2.0 collapsible Sonnar. It has a focus tab/infinity lock. It's easily identifiable as East German because it's a Jena "T" lens and it's in the lightweight aluminum mount typical of communist-bloc lenses. With the exception of the Hologon, Carl Zeiss didn't mass produce lenses for the Leica. That has now changed. The Hologon was leftover stock from its own Contarex Hologon production -- according to Charles Barringer and Marc James Small. By the way, the Leica M was not a major factor in the downfall of Zeiss-Ikon, as one post indicated. Zeiss-Ikon stopped production of the Contax around 1960 to focus on the Contarex as the marketplace shifted toward SLRs. I have two different LTM 50/1.5 Sonnars. One has a focus tab with infinity lock while the other has a knurled focus ring. f stops are of the standard variety and go down to f/22. Twelve aperture blades. Both are coated. I think these lenses were assembled with whatever was available at the time. The lens with the focus tab, also the older of the two, has a nicely finished aluminium barrel while the other is made of a much cheaper looking alloy. Both are fine performers. If this is your first venture into rangefinders then I would recommend the M system. Though I have the IIa, R2C, 50/1.5 Sonnar and 35/2.8 Biogon both post war, and they are very nice, there is no room to expand. The 21mm Biogon is expensive and not common. The post war coated 85mm Sonnar is equally pricely. Russian lenses in Contax mount are very good but you can also get those in LTM. I am more of a shooter and don't like to waste my time with tempermental antiques. Leicas on the other hand are quite trouble free with better finders to boot. I would put my money in that one lens you really want to get and worry about the body later because those Cosina Voiglander bodies are very good and will hold you over until you can get your dream M body. Whatever you do don't skimp on the lens! You're correct. However, according to Marc James Small's "Non-Leitz Leica Thread-Mount Lenses: A 39mm Diversity," most of the "official" wartime LTM 50/1.5 Sonnars (as opposed to those converted by 3rd parties during the war & afterwards) are T coated. Also, the wartime lens mounts are also made of the flimsier aluminum alloys (glass is still great, though), although some are a hybrid of pre-war parts & alloy LTM mounts. "Christopher can correct me if I'm wrong, but I think that only the wartime Sonnar was available in LTM. The lens may or may not be coated, and if coated, it may or may not be marked with a red T. FYI serial numbers greater than 3000000 from Jena are generally regarded as postwar. The Oberkochen "Opton" lenses use a different numbering scheme. The Jena postwar lenses use a cheaper aluminum barrel rather than the chrome plated brass of the Oberkochens. The prewar lenses are of HEAVY brass construction." I wrote that the M3 "helped drive Zeiss Ikon out of RFs (& eventually out of business)," not that it alone drove ZI out of business. 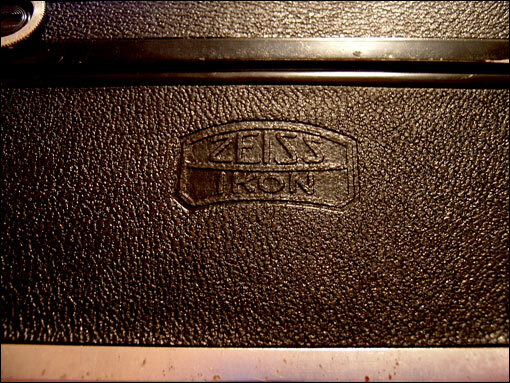 I'm no historian, as I have no official Zeiss Ikon corporate minutes or anything that confirms it. However, someone who has done the research, Hans-Jurgen Kuc, has to say in his book "On the Trail of the Contax, Vol. II:"
"At the 1954 Photokina the Contax suffered a body blow: Zeiss Ikon's archrival Leitz . . . introduced the Leica M3. . . . [List of M3's innovations.] Zeiss Ikon could not offer anything comparable, and the Stuttgarters could only respond by lowering the prices of the Contax IIa and IIIa . . . A prototype Contax with similar features of the Leica M3 had been designed in the early 1950s . . ., but it never went into series production. Priority had been given to a single lens reflex project [i.e., Contarex, which had its genesis in the mid-1950s, according to Charles Barringer & Marc James Small in the "Zeiss Compendium"]." "The appearance of the Leica M3 in 1954 upset the entire Contax pricing system. The advanced rangefinder camera moved Leitz into the forefront of the field, and even cutting the price of the Contax IIa and IIa . . . couldn't change much. . . . . There was soon even more competition for the Contax, and from its own house: the Contaflex . . ."
Of course, it was ZI's own botched corporate decision-making re: the Contarex (& other product lines), etc. that were the proximate causes of its demise, but if the M3 had never appeared, ZI may have had some breathing space (@ least until the Nikon SP or Canon P showed up, although you have to wonder if they would have appeared as quickly without the M3 to use as a model). "By the way, the Leica M was not a major factor in the downfall of Zeiss-Ikon, as one post indicated. Zeiss-Ikon stopped production of the Contax around 1960 to focus on the Contarex as the marketplace shifted toward SLRs." The Nikon F killed them all. Contax died, Leica entered into a sort of coma. "Also, despite the M3 not having 35mm framelines, I have read that the entire viewfinder can be used as a 35mm approximation. Is this true? I would really like to use an M3 due to the higher magnification and two-eye shooting capability." Re: 50mm framelines and a 35mm lens: Not really practical, if you attach any M mount 35mm lens you will not be able to focus except at infinity. Leica 35mm lenses with goggles were made only for use with the M3. They attach as 50mm lenses but are corrected to convert the viewfinder and behave like 35mm lenses. The Summeron 35mm, f3.5 w/goggles is one example and there are several others as well. You can still blind focus a standard 35mm on the M3 if you wish. Huh? A 35mm M-mount lens will focus on the M3 just like any other focal length lens, you just don't have a 35mm frame line for "accurate" framing (all framing on an RF being an approximation). The lenses w/the built-in "eyes" just change the magnification of the M3's VF to convert its 50mm frame to the equivalent of a 35mm frame on an M2, etc. The entire M3 VF, incl. the area outside the 50mm frame, is really closer to 40mm (which is why some of us like to use 40mm lenses on the M3) so it's pretty close to 35mm & can be used in pinch; obviously, there will be no parallax compensation, but you can guesstimate by checking the position of the 50mm frames. "Re: 50mm framelines and a 35mm lens: Not really practical, if you attach any M mount 35mm lens you will not be able to focus except at infinity." Owned Leicas, everything from an M4 through an M7, used them exclusively for more then a decade, but now I shoot 50's Kiev IIs and a prewar Contax II. The Contax mount cameras are at least 85% of a Leica M3 onward at 5% of the price. Both are capable of great pictures; of course, old lenses are different then modern optics.